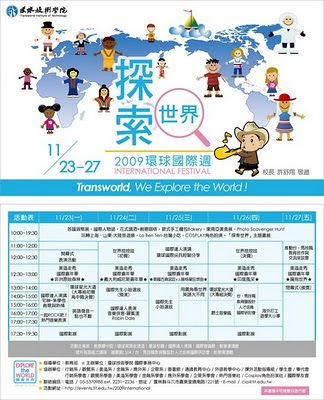 2009 Transworld International Festival, with an emphasis on Exploring the World as its theme, kicks off at the plaza of Chuangyi Building in Chiatong Campus on November 23. Combining education with recreation, the Festival is not only meant to be a kaleidoscope of joys, smells and sounds, but also to enhance the global view of students, teachers, staff members, and all of the participants. The festival is regarded as one of the biggest campus-wide international events in the regions of Changhua, Yunlin, and Chiayi. We would like to welcome you to embark on this tour of multi-cultural immersion together! With a substantial grant from the Ministry of Education for three consecutive years to promote the internationalization of the campus, Transworld Institute of Technology has decided to extend the scope of the Festival by pooling resources and support from the agencies concerned, including the following departments: Styling and Cosmetology, Applied Foreign Languages, Tourism and Hospitality, Marketing Management, Finance, Business Administration, Visual Communication Design, Foreign Languages Teaching and Learning Center, the Extracurricular Activities Section of Student Affairs Office, the Public Affairs Section of the Secretariat Office, the Center for General Education, the Library, the Environmental Planning & Management Center and General Affairs Section of General Affairs Office, the Student Association, the Graduate Student Association, Pop Music Club, Cosplay Club, Associations of the aforementioned Departments, International Students Friendship Association, and Transworld Ambassadors. This broad cooperation will ensure that the Festival receives the widest possible attention. This one-week Festival highlights Transworld Style Jazz, Models Catwalks, Foreign Languages Singing Contests, Mr. & Ms. University International, Jazz Music Mania, Flair Bartending Show, Let’s ROCK together, Cosplay, World Portraits, Book Exhibitions, and Money Fair, Travel to Shanghai and Shandong, Special Performances prepared by International Students, The Robin Hood Show, Global Gurus’ Lectures Featuring Lucifer Chu, Peter Hsui, Transworld Students, Seminars on Improving English Language Abilities, World Knowledge Tournament, Photo Scavenger Hunt, International Conference on Vocational Education & Professional Development of Design between Taiwan and Malaysia, International Food & Drink Expo (Southeast Asian Cuisine, Taiwanese LBT, Soft Drink & Coffee, and European Bakery), International Film Festival, just to name a few. On November 23-27, at Transworld, we Explore the World!